is my latest project, inspired by the many beautiful ones I've seen on the Internet, especially on flickr. 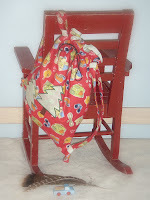 The backpacks are child sized, but with straps that adjust to be long enough for an adult to carry them. One of the best things about the backpacks is that they can be boyish. It's so easy to make girly things ... add a little ribbon, lace, floral fabric to a pretty fabric and there you go. Not so with boys ... even trim has to be "just so" or it looks girly. It has been so fun making boy stuff ... and my boys are in heaven knowing they'll get whatever doesn't turn out quite right. is more of my family. I think they look very dysfunctional, but at least they were e-mailing each other while on their laptops. When A. and M. go to speech the other boys and I head to Goodwill. This isn't our favorite Goodwill by any means. It's not one I'd ever go to if I were in search of something. 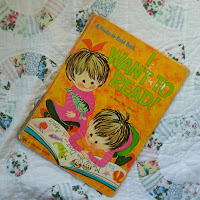 But for some reason they usually have good older books for kids, so much so that I. proclaimed, "oh good, we're going to the book Goodwill" as we pulled into the parking lot. 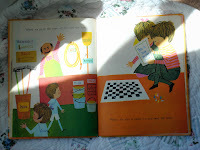 We've found other odd treasures there too ... a fantastic crib for Ditto Kiddo, a cover for I. 's Flypen, and some misc. linens, but it's the books that keep us coming back. We found some fun ones today. 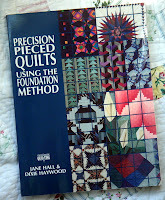 First, a book on foundation pieced quilting for me. I stink at following directions, so I may never actually use the book to make a quilt but it'll make a good reference ... and it makes me feels so grown up to have a real book on quilting. 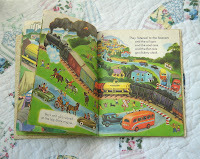 And then the kids books. All these books came from the same family. I believe I can say that with great confidence as all of them are written in, and all have the same names written in them. 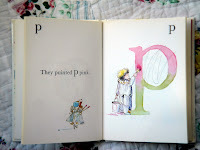 Normally I'd have passed on them, I'm not a fan of books with scribbles in them, but with A. and K. just learning how to read I felt we'd get our money's worth out of them (.59 each!). 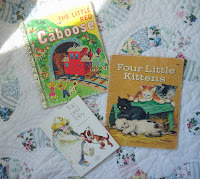 I think M. will appreciate the Beatrix Potter books too. I love the pictures in the Top and Toby book, pretty colors, simple lines ... except for the pencil scribbles through all of them. Ah well, I'm sure by letter 26 we won't even notice the pencil anymore. Great job on the project. Don't you just love all the fun stuff you can find on the internet. I love visiting different sites to see what people are working on.